Disney Girl: Middle School! Yikes! Tomorrow my "baby" starts Middle School. Where has the time gone? It seems like yesterday that she was just a cute little four year old asking when she could go to school. As I was writing my daughter her back to school letter it occurred to me to blog about it. Maybe some of you do this or maybe you don't. At the beginning of every school year I write my daughter a letter. In the letter I write what all of her interests are at the time (friends, t.v. shows, sports, books she has recently read, etc.) I also write what I hope the upcoming school year brings for her. At a time when life is hectic and I cannot keep up with her scrapbook & journal this is a great alternative. I would love to hear if any of you do the same thing for your kids. Well off she goes tomorrow to Middle School. 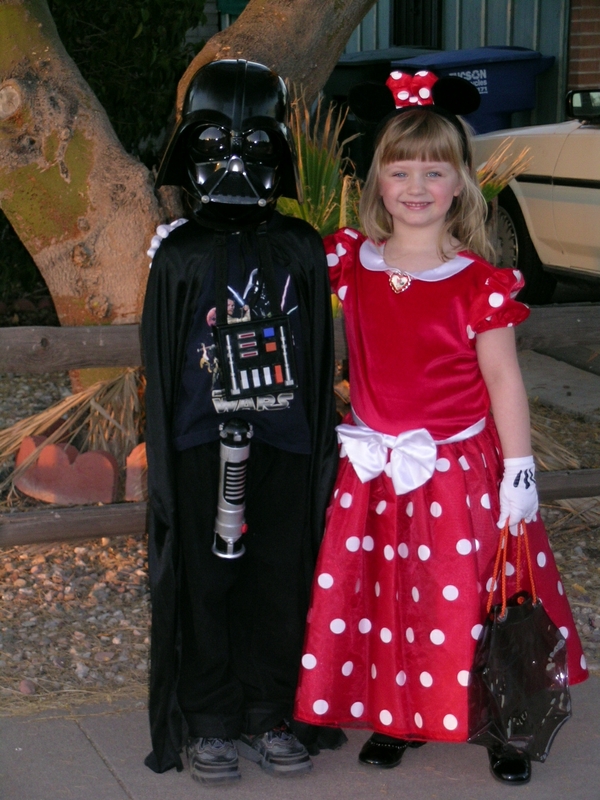 Her cousin (Darth Vader in the above picture) will be with her. This is the first year they will overlap at the same school. While it is her first year there it is his last and then he is on to high school. Once again, where did the time go? I hope that you all have a fabulous day! Thanks for stopping by! This post is linked up to Wonderful Wednesday Link Party #13 over at Printabelle. Head on over there and check it out. Better yet, link up & join the party. ;(...I remember how excited we were waiting all those months for her to arrive, now she's becoming a beautiful young lady. Can't wait to hear about how her first day of middle school went. The years sure fly by! But if I were you, I'd be quite relieved to know that Darth Vader is there to protect her! The letters are a great idea! I've been taking their 1st day pictures each year. Even when they were older and were too embarassed, We'd go back in the evening when noone was around so I could get the picture. Now I need to find where I have them all stashed. Thanks for sharing!